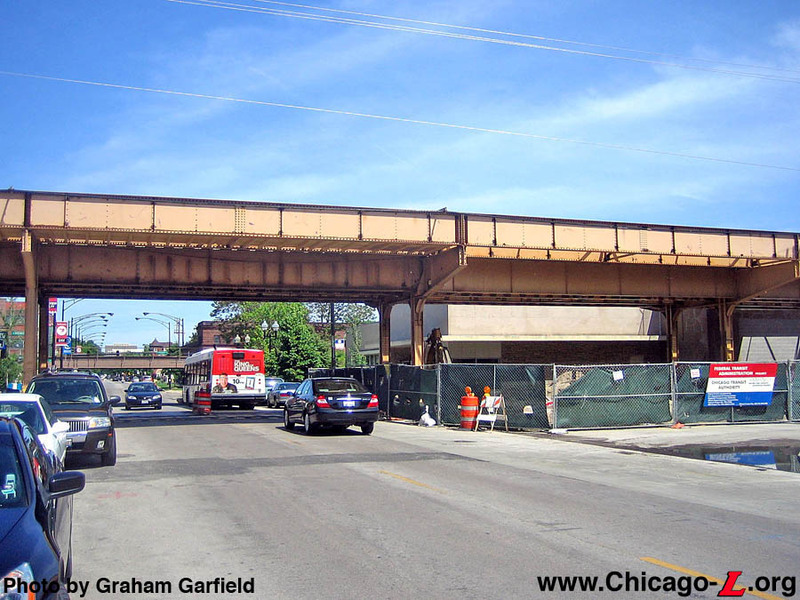 Montrose opened with the initial construction of the Ravenswood branch of the Northwestern Elevated, which was placed into service May 18, 1907. 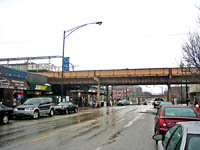 The station was designed in 1905-06 by the Northwestern Elevated's Engineering Office and overseen by Chief Engineer C.M. Mock and Consulting Engineer Charles Weston. The station was built by the Angus Brothers construction company. 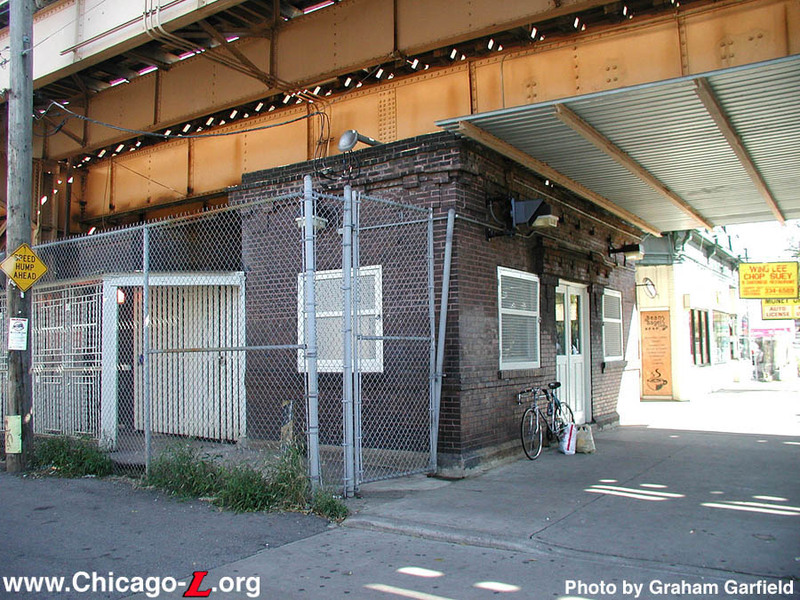 The station house measured approximately 25 feet by 25 feet -- a modest size and scale, relating to its role as a modest neighborhood station -- and, when viewed in plan layout, was shaped like a bow-tie. Passengers entered through the front doors and could exit through the building as well, but ancillary exits were also available along the sides of the building's exterior. The building narrowed in the middle to provide space for a exit-only rotogate on each side of the exterior, which passengers could exit through without entering the building. The inclusion of such egress was a result of experience with earlier stations, at which circulation could become congested when passengers tried to enter and exit through the same confined space simultaneously. In later years, the west rotogate was removed and that side passage closed. The east rotogate and side passage remained in use until the station was demolished and rebuilt. The building's exterior was constructed of dark red brick and had a fairly simple design. The foundation was built of stone and concrete. The exterior walls were largely unadorned, except for simple ornamentation around the cornice, belt rail, and in the hood over the front entrance, all of which were executed in the same brick as the rest of the exterior. The doors originally had multi-pane windows, later removed. After exiting through the station house's rear doors, passengers walked down an enclosed passageway to access the stairs to the platforms. 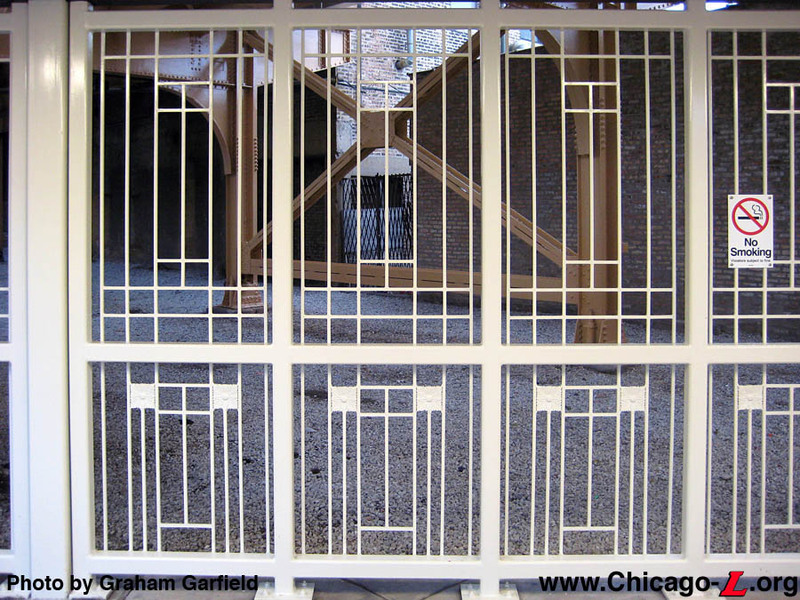 The passageway featured full-height grillework consisting of bars arranged in a geometric Craftsman pattern punctuated by ornamental cast iron rosettes and an arched galvanized iron roof. 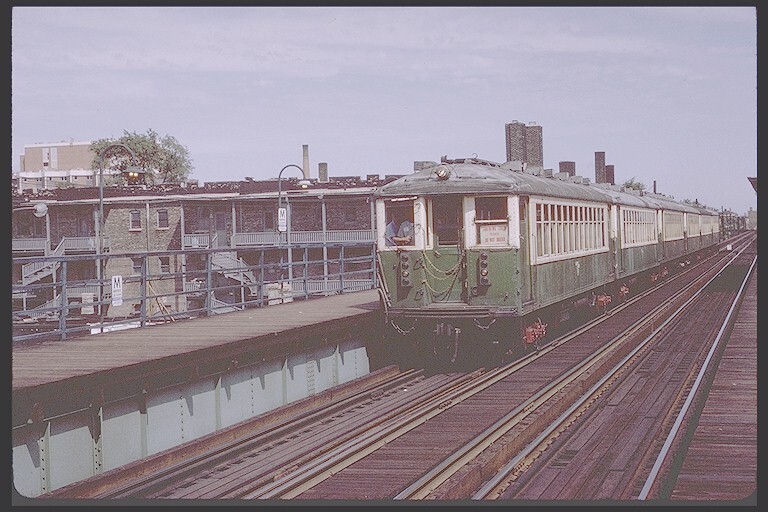 Originally, there was a full-height grille down the center of the passageway, meaning passengers had to exit through a specific rear door to access their desired platform, or they would have to reenter the station house to switch to the other side. Most of the center panels were later removed to allow access to either platform from the passageway. The decorative grillework was carried up the stairways to the platforms. Montrose featured dual side platforms, constructed of a wood deck on a steel frame. The platforms featured canopies in the center, covering the stairs from street-level. 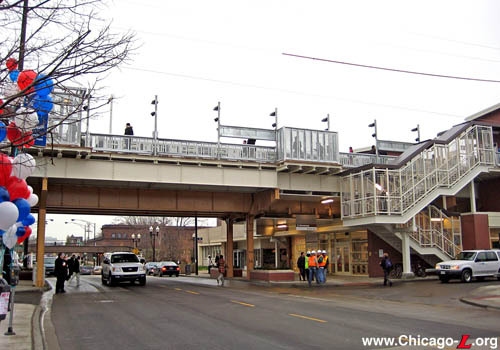 The canopies, which were typical of the 1907 Ravenswood branch stations, featured a gently arched roof with curved support columns and latticed framing. The platform railings consisted of cast iron posts supporting thin metal bars and ornamental sunflower rosettes in a geometric design alternating with flat panels, topped with an oak handrail. 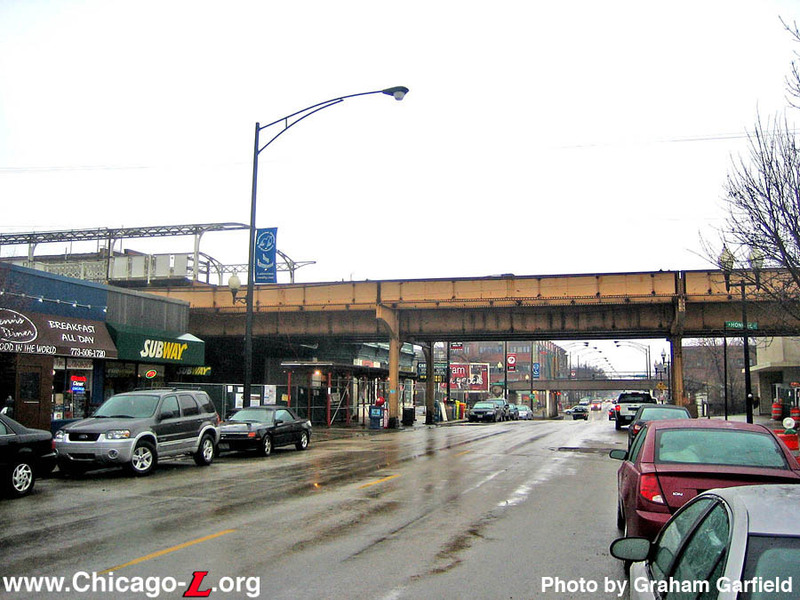 The canopy design would be reused first on the Chicago & Oak Park Elevated (also owned by Charles Yerkes) before becoming the standard for the "L" under the Chicago Elevated Railroads and Chicago Rapid Transit. The railing design was also reused elsewhere on the system, most notably at Clinton/Lake where it was duplicated almost exactly. 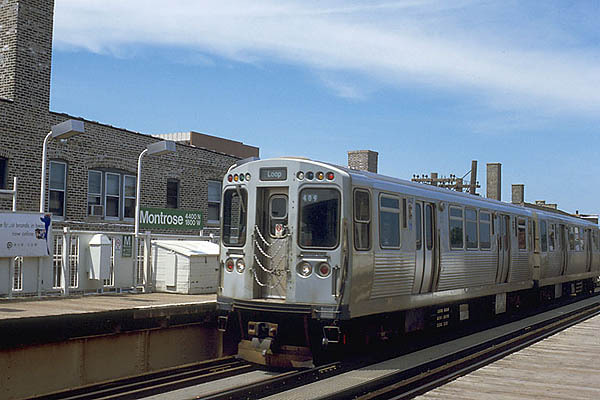 Montrose became an "AB" station under the skip-stop express system instituted on August 1, 1949, but became a "B" station on September 2, 1973 when Paulina closed and Addison became an "A" station, thus balancing the skip-stop service levels. 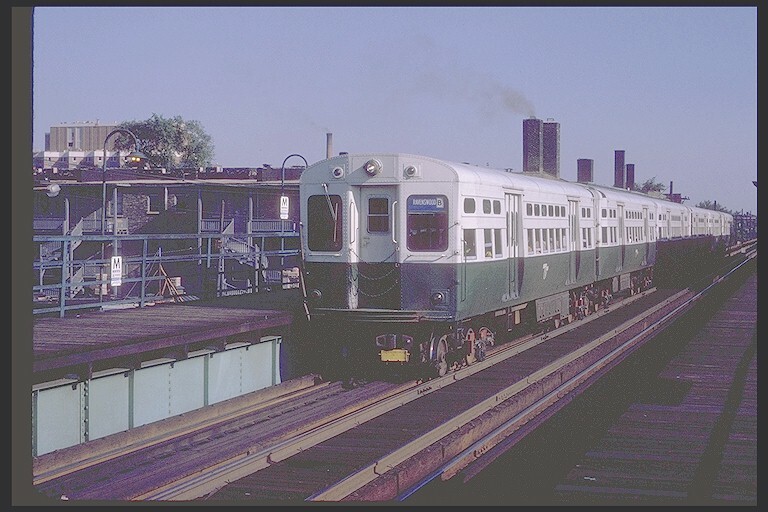 The station reverted to an all-stop when A/B service was discontinued in 1995. Montrose station retained much of its original material until it was renovated in 2006-07. 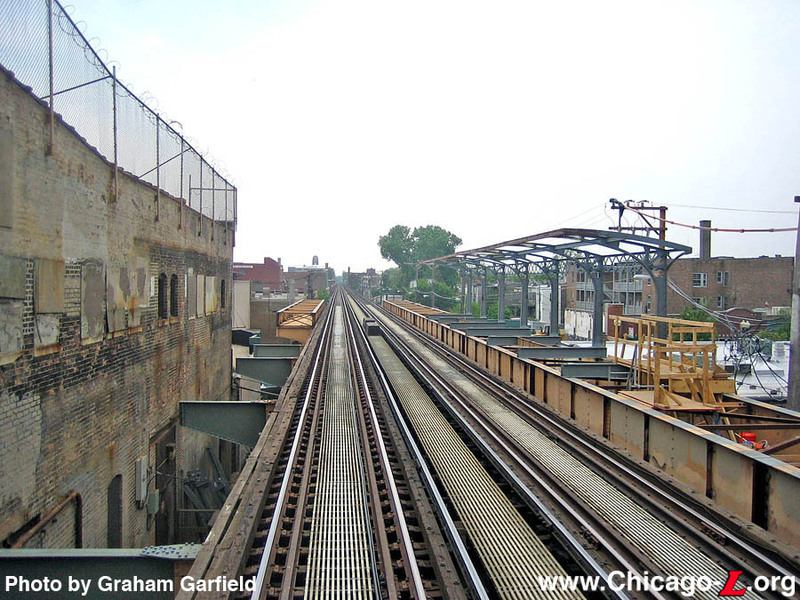 In addition to the original station house and canopies, a great deal of the original platform railings were also intact from the north ends of the platforms (including the original curved end pieces) to approximately over the centerline of Montrose Avenue. The platform extensions at the south end , added later, had simple, modern metal railings. 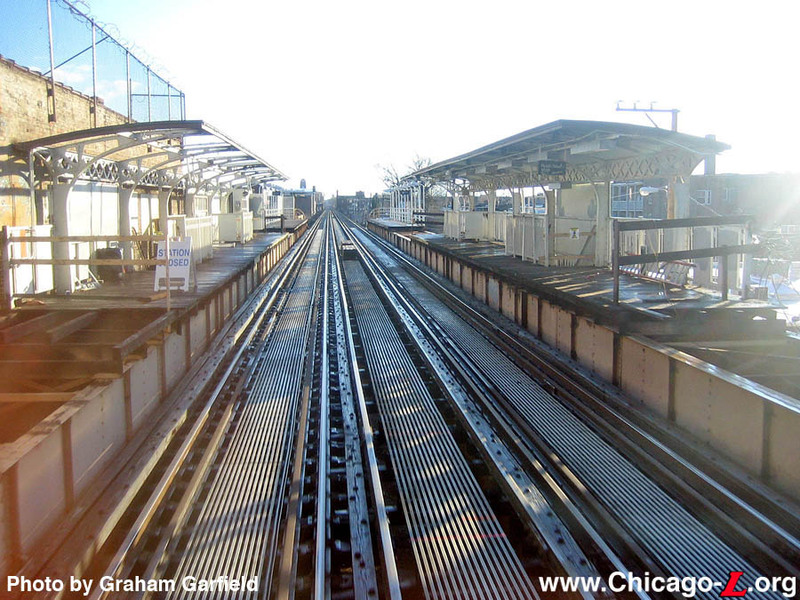 By 2004, ridership had exploded on the Brown Line -- an 79% increase since 1979 and a 27% increase since 1998 -- that during peak periods many trains were at crush-loaded, resulting in commuters left standing on platforms unable to board the loaded trains, sometimes waiting as one or two trains passed before they were physically able to board. 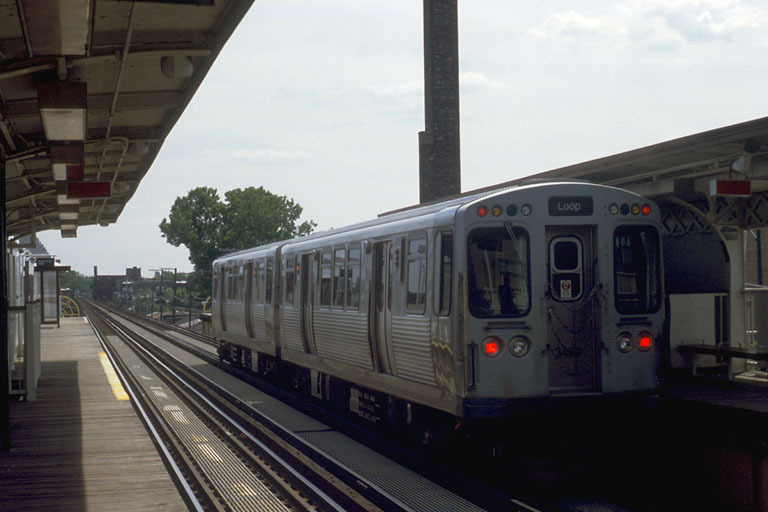 The problem in large part was that all Brown Line stations could only accommodate six-car trains (with the exception of Merchandise Mart, Chicago, Fullerton and Belmont, which could already hold eight-car trains), which, along with the limitations of the cab signal system, limited the line's capacity. 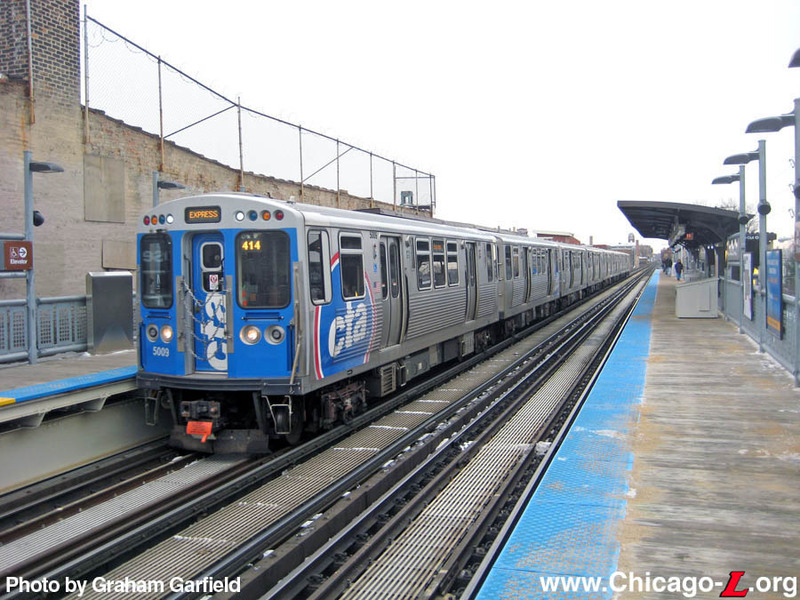 On April 13, 2004, the CTA announced that it had officially received a Full Funding Grant Agreement (FFGA) from the Federal Transit Administration (FTA). 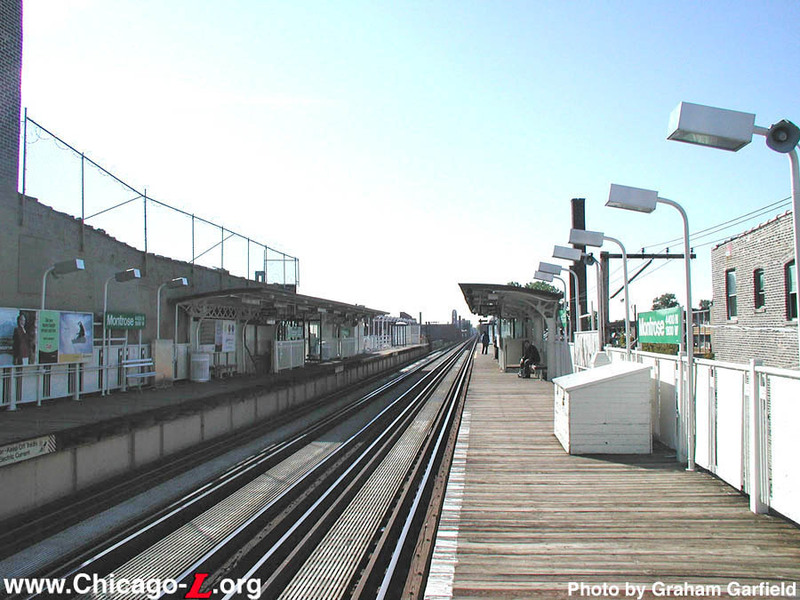 However, in May 2004, CTA received construction bids for the project that substantially exceeded the budget. 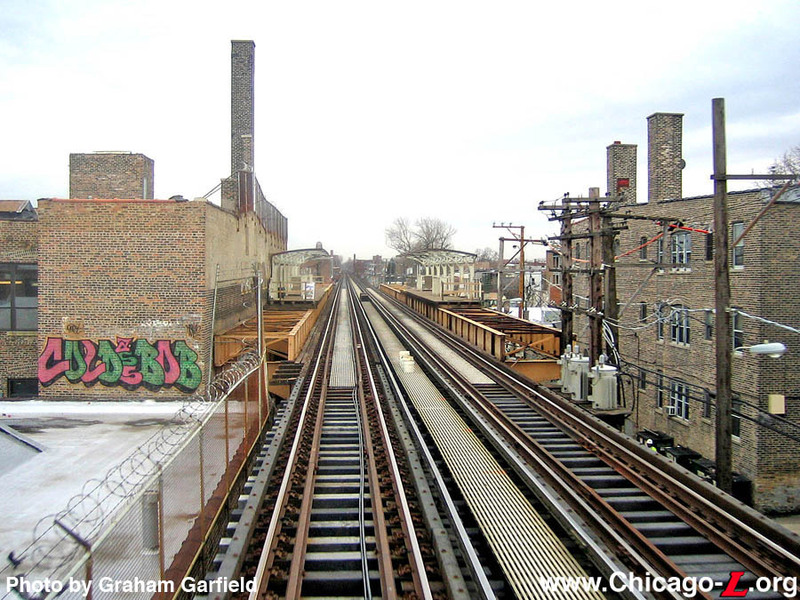 As such, the Chicago Transit Board voted on June 9, 2004 to reorganize the project into several discrete pieces to help attract more competitive construction bids. Station renovation work was modified and grouped into five separate packages according to location to help reduce the overall cost of station construction. 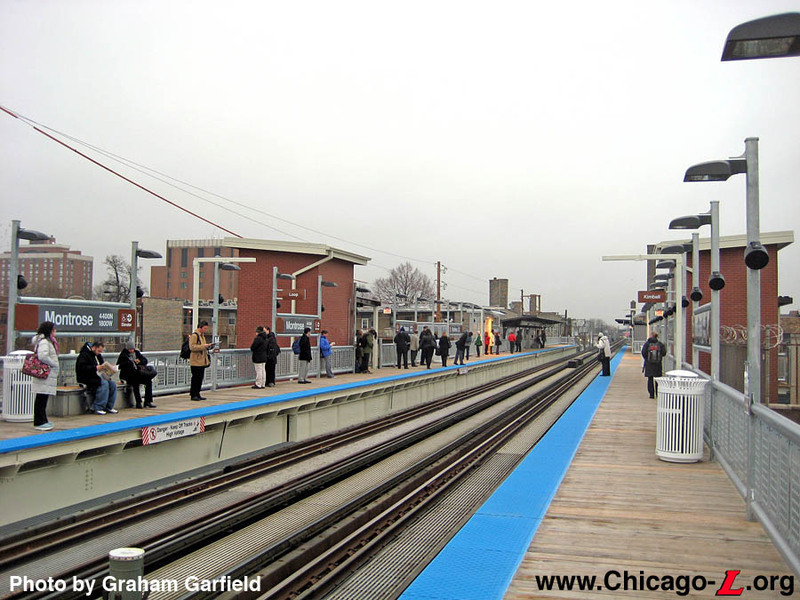 Montrose station was grouped with Damen, Irving Park, and Addison in a bid package, all of which were designed by the same consultant, Earth Tech, Inc. Station designs were also revised to reduce costs. Most changes concentrated on non-customer areas such as reducing the size of janitor closets, employee restrooms, electrical rooms and communication rooms. 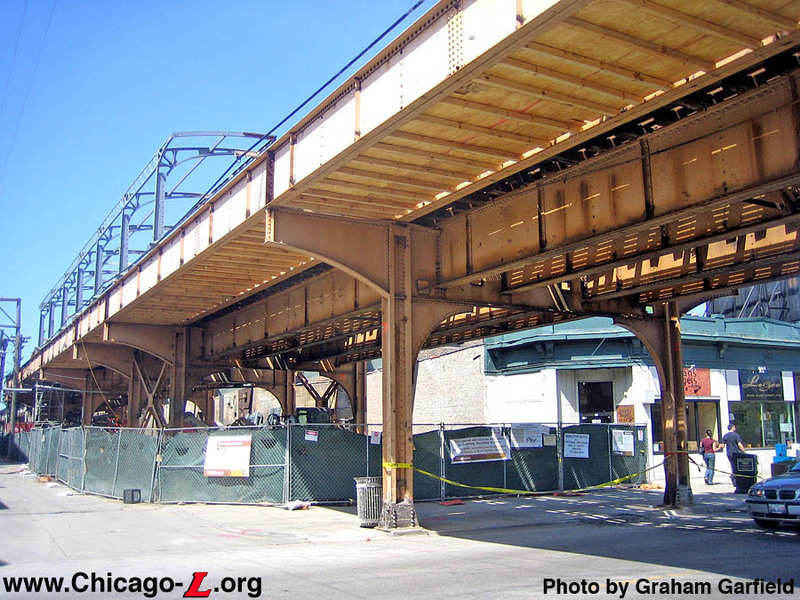 Other areas that were studied for cost reduction were standardizing common station elements, the use of less expensive materials, canopy designs and coverage, and temporary station closures to provide contractors better access to the sites. 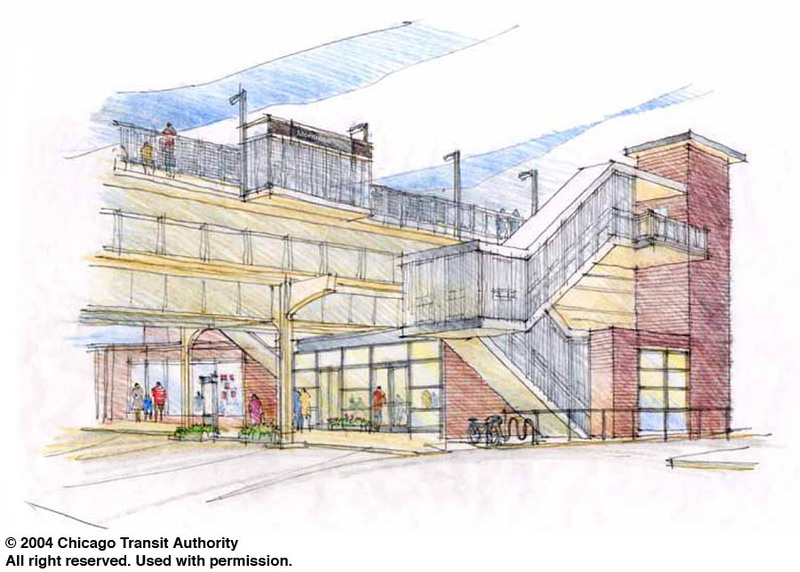 The contract included construction of a new, modern station house, extension of the platforms to accommodate 8-car trains, and installation of elevators for ADA accessibility. 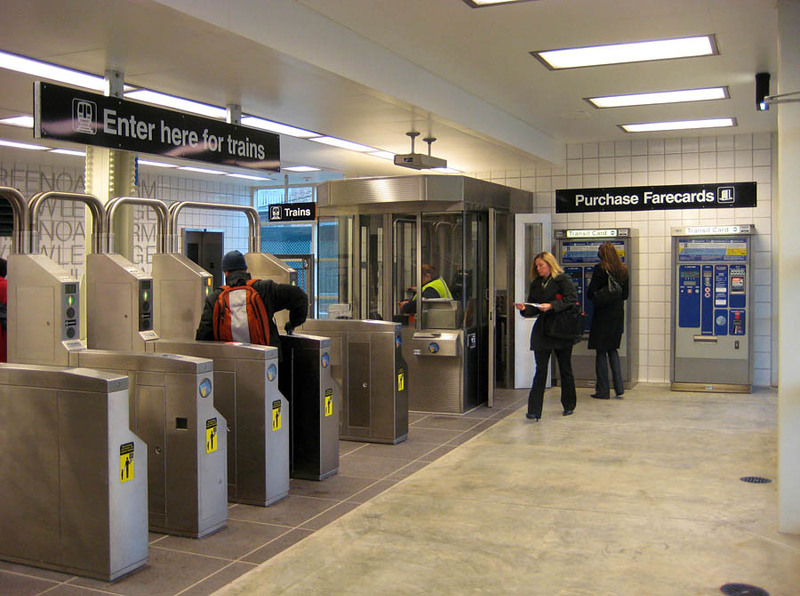 The new expanded station facility featured an increased number of turnstiles and farecard vending machines. The new station house is located on the south side of Montrose Avenue, the opposite side of the street as the original 1907 station house. The station house is clad in glazed brick with metal coping along the top. The front of the station house features a glass storefront framed by aluminum mullions. A dual set of double doors are divided by a central window bay with a concrete planter in front, framed on each side by window bays with thin sans-serif lettering spelling "MONTROSE" divided on two lines, and topped by transoms. A shallow cantilevered canopy covers the front elevation. The dual elevator towers are clad in glazed brick and feature distinct sloped roofs. The interior has a largely open plan. A Customer Assistant booth is located in the middle of the interior on the west side and a stainless steel concession booth is located on the east side, with a row of turnstiles between the two separating the unpaid and paid areas. The farecard vending machines are located on the west wall. The walls are clad in white square tiles, while the floor is cast concrete (except under the turnstiles, where it is granite tiles). Montrose station features original artwork depicting the street names within the community. Affixed to the rear (south) wall in the station house's paid area, the artwork was created by artist Jason Pickleman. 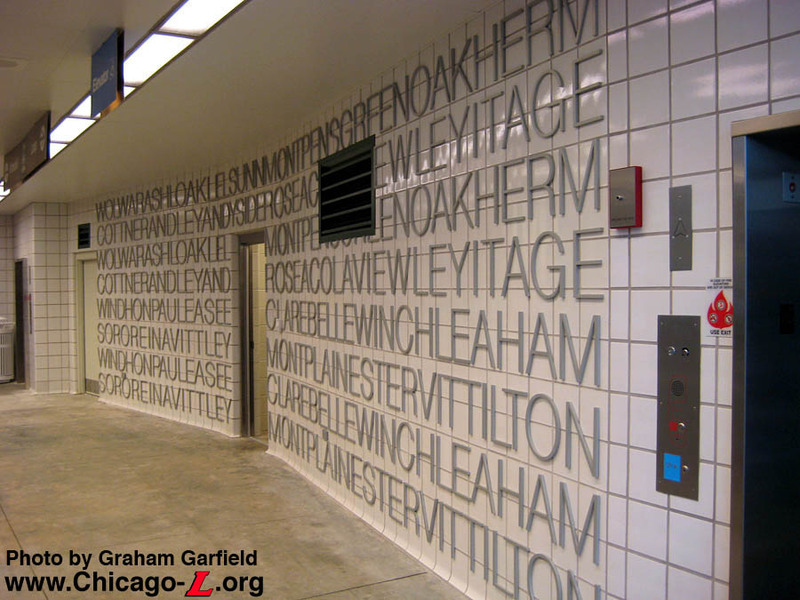 To foster a sense of ownership and identity within each station and the surrounding community, the CTA partnered with the City of Chicago's Department of Cultural Affairs to install public art at all 18 renovated Brown Line stations. Public art for each station in the project was a requirement of the Full Funding Grant Agreement and is part of the overall project budget. A set of stairs and an elevator provide access from the paid area to each platform. Unlike most stations, whose stairs to their platforms are largely hidden behind their station houses, Montrose's are to the sides and project toward the street rather than away from it as they ascend upward. At the first landing the stairways turn, with a 180-degree switchback, before reaching the platform. As a result, the stairways are a dominant feature of the station facility when viewed from the street. The stairways to the platforms are enclosed in a white-painted steel grille system of thin bars punctuated by ornamental sunflower rosettes divided by a heavy tubular steel framework. Although the design of the grilles are meant to evoke the original station's railings and stairway grilles, they are new construction. The rosettes, however, are reused from the original facility. The dual platforms were renovated with new decking, railings, lighting, signage, and other fixtures. The existing original canopies were retained and refurbished, stripped of decades of paint, repainted dark brown, and topped with new corrugated metal arched roofs. 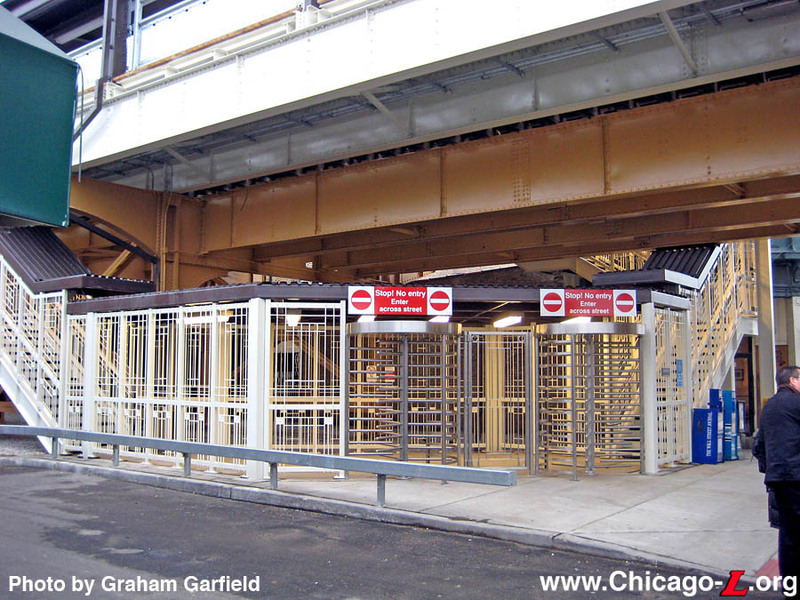 The new railings are a standard design for the rebuilt Brown Line elevated stations, with thick tubular top and bottom horizontal members with rectangular panels with a grid pattern cut out. The railings and light poles, as well as the other new metalwork, are hot-dipped galvanized. The light poles are integrated into the railing posts. The platforms are finished with windbreaks integrated into the railing system -- some of which are cantilevered out over the street, so as not to reduced the width of the platform at those locations -- with the glass panels protected by metal grilles matching the railings. New benches with sandboxes integrated into them dot the platform, posts with projecting horizontal arms for A/V signs (to be installed later) are suspended over the platforms, and Transit Information panels are posted at the tops of the stairs. Other improvements include new signage; new electrical, communications, and HVAC equipment; customer heaters on the platforms; security cameras; and a state-of-the-art announcement system. 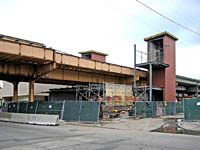 Montrose station closed at 3am, Saturday, December 2, 2006 for renovation, the same day as Addison station two stops south. The station temporarily closed for just under 12 months while construction crews worked to extend the platforms, rebuild the station house and make the station accessible to customers with disabilities. 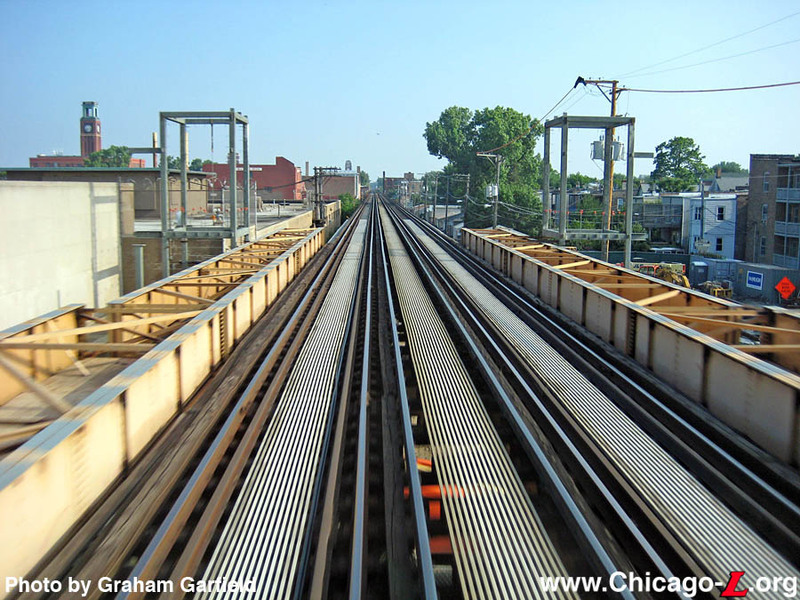 Consistent with the CTA's pledge that no two consecutive stations would be closed at the same time on weekdays, the adjacent stations -- Damen and Irving Park -- remained open during Montrose's temporary closure so customers could continue to access Brown Line service. In addition to the neighboring stations, alternate service was also available from several area bus routes. 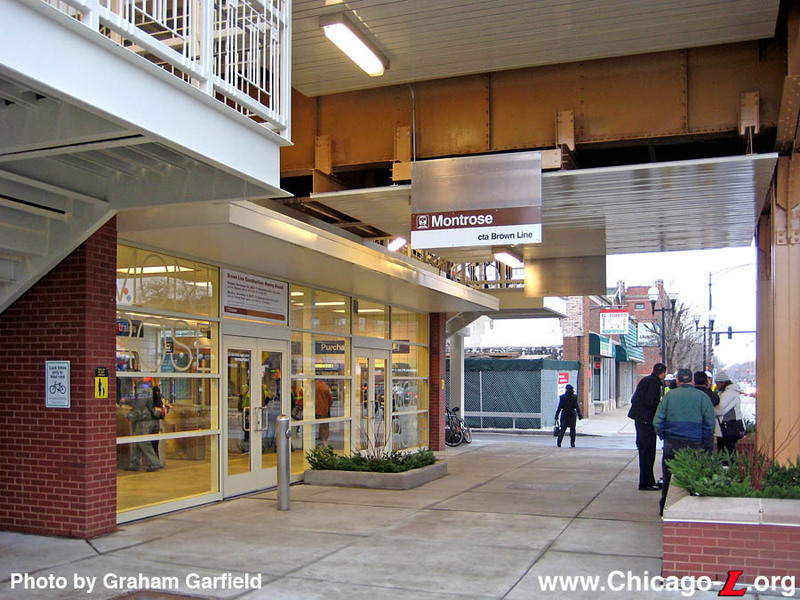 Work at Montrose began almost immediately after the station closed. During December 2006, the station house and platform decking were completely demolished. Many of the platform stringers were also removed for replacement. The platform canopies were also disassembled, with the roofing removed and the structure stripped down to the frame. During winter, the southbound canopy was refurbished and primed; however, the northbound canopy had not yet been reinstalled. 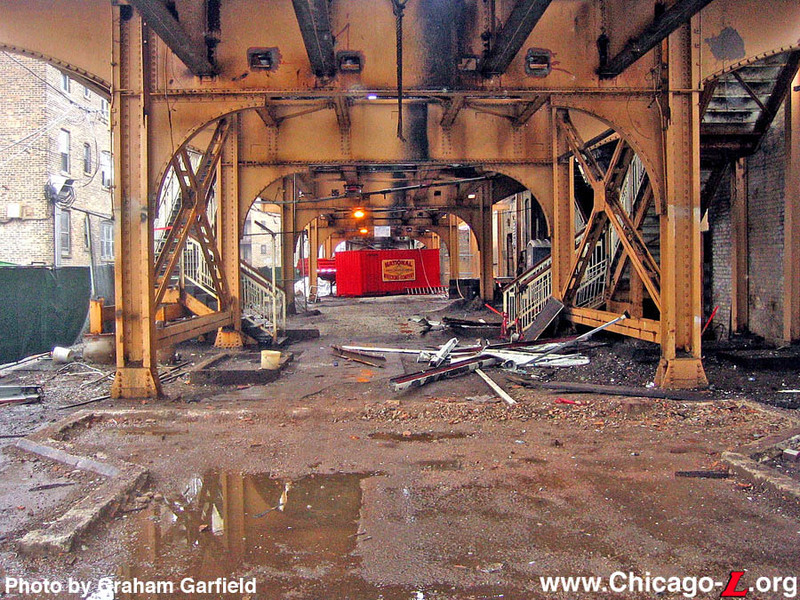 Work continued into spring 2007 on refurbishing the existing elevated structure columns and footings, as well as the existing platform and canopy steel. Installation of the steel framing for the platform also began. During May 2007, work began on the foundations for the new station house and auxiliary exit. In June, crews began erecting the steel frame for the new station house. The steel frames for the new elevator towers were also installed during this period. By July, the steel framework was in place and work began on the masonry cladding on the station house and elevator towers. After the structures for the station house and elevator towers were in place, erection of the remaining platform stringers was completed. During July, installation of the platform wood decking and steel railings commenced. In mid-July, temporary barricades were installed along the platforms, protecting the construction workers and allowing them to work without interfering with passing trains. During summer, work continued on the platforms, as well as on the installation of elevator equipment. Station house build-out continued through summer and into Fall 2007. Work included installation of masonry walls, plumbing, electrical systems, and HVAC systems. During the same period, work also continued on installing platform decking, railings, light poles, and other fittings. 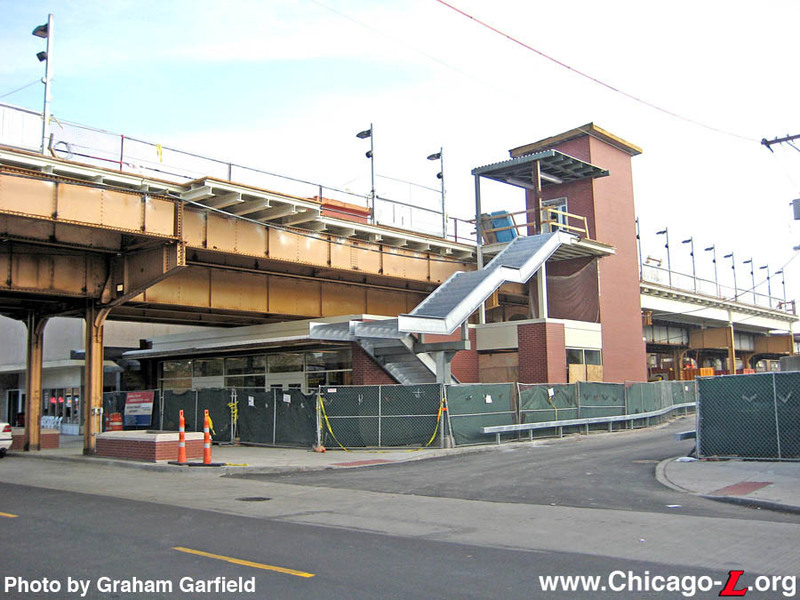 In late summer, the new stairs from the station house to each platform were installed. Installation of elevator equipment continued into Fall, as did railing installation and refurbishment of the original platform canopies. By Fall, the structure of the northbound canopy had been reassembled back in its original location. By October, most of the station's structure was complete. The station house's and elevator towers' brick cladding was completed and the station house's metal and glass panels were installed. The steel for the stairs and landings was in place and the railings and light poles were nearly complete. 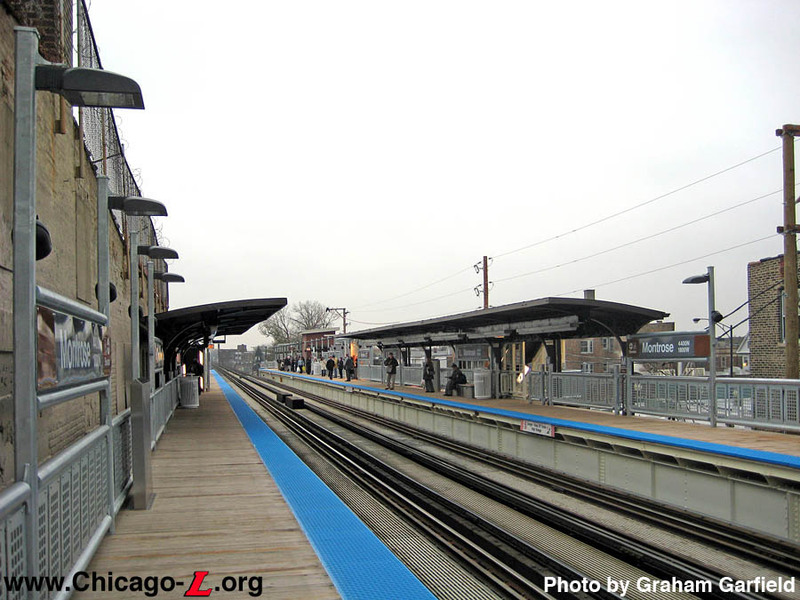 During October and November, the platform light fixtures and speakers were installed. During Fall, the new steelwork was painted. Contractor crews spent late Fall 2007 finishing the details of the new facility. Raised concrete and glazed brick planters were installed outside the station house and auxiliary exit along the street, under the elevated structure. Other items installed during this period also included a compass rose on the sidewalk in front of the station entrance, bike racks under the stairs on both sides of the station house, and new signage throughout the station facility. Montrose station reopened at 4am, Monday, November 26, 2007, six days before the one-year deadline from the date of closure. 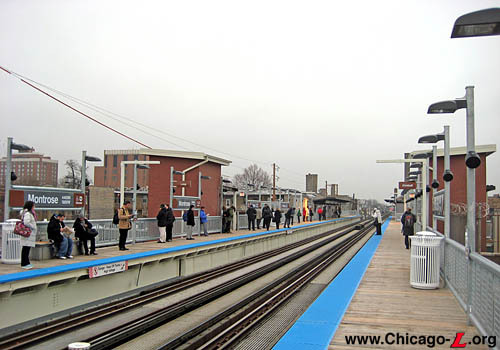 CTA President Ron Huberman, Congressman Rahm Emanuel, and 47th Ward Alderman Eugene Schulter gathered at the Montrose station to mark the reopening of the station at a press conference at 10am that day. 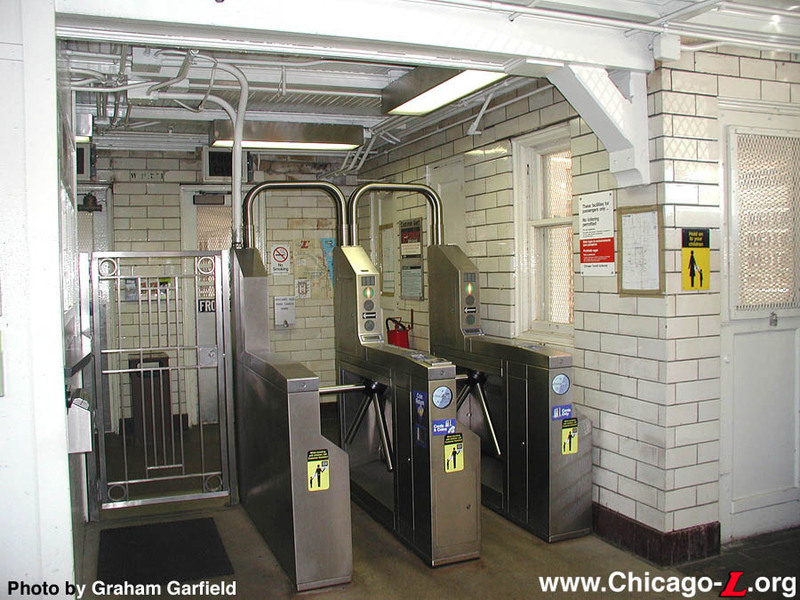 With the new elevators in operation on opening day, Montrose became the 79th of the CTA's 144 station to become accessible, with other ADA-compliant features including an accessible turnstile, tactile platform edging, gap fillers, TTY telephones and Braille signs. 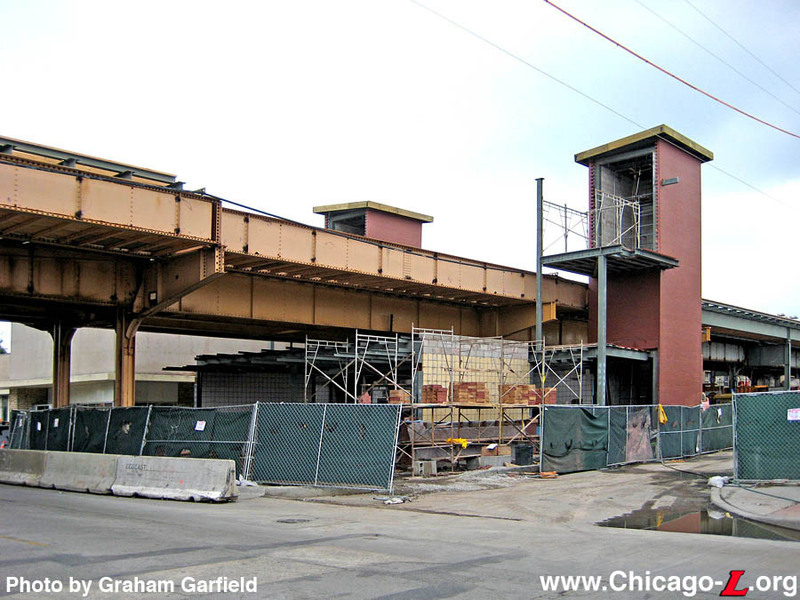 At the same time Montrose reopened, the Damen station closed for renovations for up to one year. 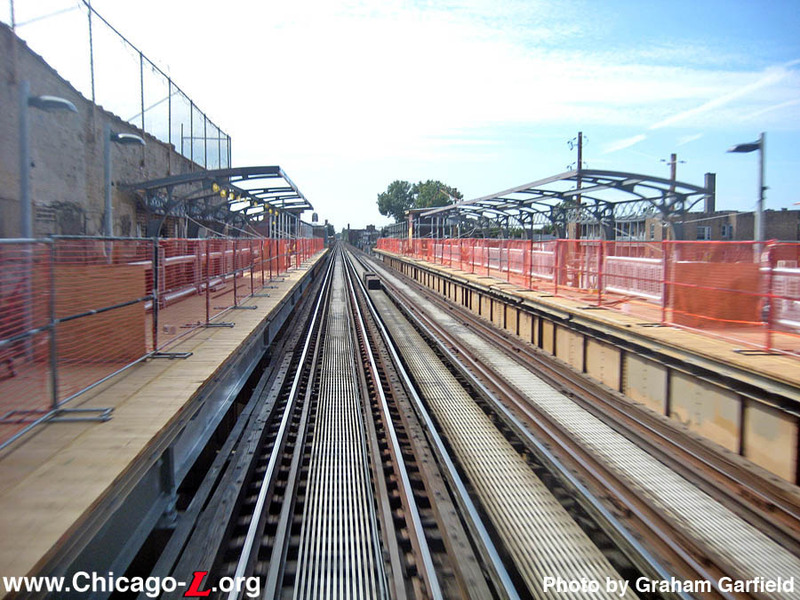 Modest work continued at Montrose station after the reopening, as the contractor completed various punchlist work.